Did you know that there are more types of chickens than any other bird species in the world? 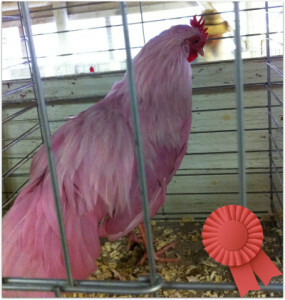 There had to be at least 30 entries in the chicken barn, and that doesn’t even include the rooster competition. You could specifically see how some were very different in plumage, size, and even temperament. Check out the pink babe above. She definitely popped a few eyeballs. Are you in an industry where there is so much competition that it’s hard to stand out. Think of all those chickens. How can you make people stop and look at your product or service? How can you win the top ribbon at your next prospect meeting? I met an 8 year old girl named Abbie, who was in the pig competition. I was admiring her pig Floppsy and the 1st place ribbons hanging on the gate. She was sitting on top of the stall, so I asked her what she and Floppsy had to do to win them. “I’ll show you,” she said, and then jumped down, ran around the corner, and came back with her special cane. Abbie crawled back in the stall, and without waking her precious pig, she explained how she led the pig in the show ring. Using the cane she pointed out where she would gently tap him, to make him do her bidding, and then brush him for a gentle reward. The first place ribbons were for different aspects of the competition, but she explained that the big rosette ribbons were the true winners. She then went on to explain why she lost out on the big prize. “When there is a close race, and the judges can’t decide, they ask you questions,” she explained. “I got my answer wrong,” she said, without a hint of embarrassment. She explained her answer, and what she should have said, plus way more information than I needed. In essence, Abbie had failed at her attempt, and learned from her mistake. What did you learn from your last business failure? Were you confident in admitting what went wrong? How did you implement changes? Jerryn was the next young lady we met. At 14, she was a seasoned 4H-er and eager to make money from her white, New Zealand rabbits. My husband has been keenly looking to buy rabbit meat that didn’t cost a small fortune. Jerryn figured out all the answers for us. Surprisingly, it costs a lot of money to buy a young rabbit – nine bucks! Then you have to feed it for a year, before it’s time to send it to rabbit heaven. It would become cost prohibitive for people to buy. We explained that the meat was also difficult to find. She asked us questions and we all shared ideas on how she could possibly turn her rabbits into a lucrative businesses. Jerryn is a very smart young lady who recognized an opportunity to grow her business in a new way. We even discussed trading her rabbit product for a product we had, that she was keenly interested in. We’ve got a new organic meat connection, and Jerryn has her first clients. What questions do you need to ask to look at new business opportunities? Who can you brain storm ideas with that may be mutually beneficial? Where is another avenue you can take your business? These kids we witnessed at this small country fair, are the movers and shakers of tomorrow. Take a lesson from them, and learn, grow, lead, plan, set goals and achieve. Gain the confidence you need to stand out. Look at ways to shake things up. How are you using your head, heart, hands and health to grow your business and your community?